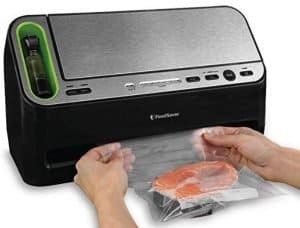 Handheld vacuum sealers keep your food fresher for longer – without taking up all your counter space and making enough noise to wake the neighborhood. Seal meat. 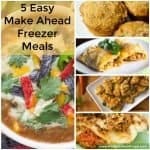 Stock up when your favorite meats are on sale without worrying about freezer burn. Seal perishables. 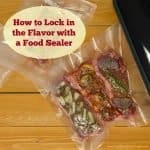 From fresh herbs to guacamole and other perishables, a sealer will keep your foods fresh for longer. Seal leftovers. Keep your leftovers as fresh as possible to enjoy the next day. 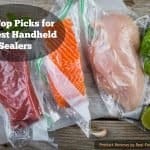 Seal foods for sous vide cooking. Many vacuum seal bags are compatible with water circulators, so you can enjoy sous vide cooking. Making the decision to buy a handheld sealer is the easy part; finding the right model is the challenge. We know how hard it can be to find a high-quality, compact vacuum sealer. 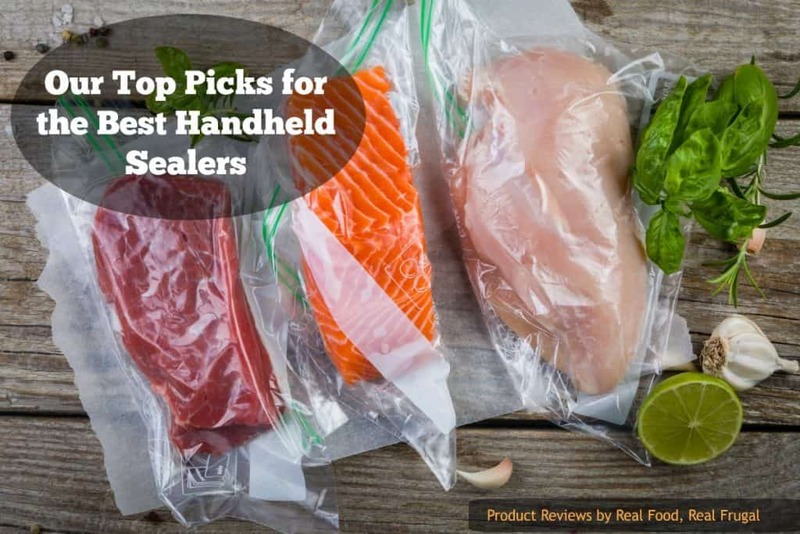 To make your decision easier we’re going to review our top four picks for the best handheld vacuum sealer. All of the sealers on our list are high quality, so you can be sure you’re choosing a product that will last. These models are also easy to use and highly versatile, so you can make the most out of your purchase. And of course, we also take cost into consideration. Whether you’re budget conscious or just after the best product available, we have a model that’s right for you. 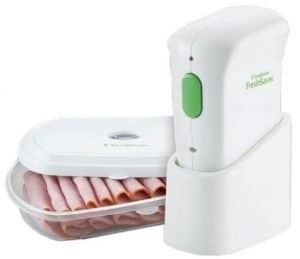 Designed with convenience and ease of use in mind, the FoodSaver FreshSaver FSFRSH055 is a cordless vacuum sealer that helps keep foods fresher for longer. 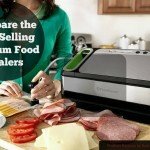 This handheld vacuum sealer is compatible with FoodSaver deli containers and vacuum zipper bags. Easy to clean and simple to use, this sealer is ideal for busy households. One-touch operation makes sealing foods a breeze, and the nozzle can easily be tossed in the dishwasher for easy cleanup. The nozzle also catches any overflow liquids that would otherwise make a mess. The FSFRSH055 comes with a zipper bag starter kit, deli tray, and charging stand, so you can start using it right away. If you’re looking for a simple, powerful and compact food sealer for use with deli containers and vacuum bags, the FoodSaver FSFRSH055 is a great choice. View pricing and availability of the FoodSaver FSFRSH055. The FreshSaver FSFRSH0051 from FoodSaver is similar to the FSFRSH055, but slightly smaller in size. Offering cord-free operation and powerful vacuum sealing technology, this model is ideal for small to medium-sized families. The FreshSaver FSFRSH0051 is a compact, easy-to-use vacuum sealer that offers simple one-touch operation. Powered by battery, this sealer can be used on the go and recharged when needed. A built-in nozzle catches overflow liquids that would otherwise make a mess. The easy-clean nozzle can be tossed in the dishwasher in between uses for easy clean-up. Like other handheld sealers from FoodSaver, the FSFRSH0051 can be used with vacuum seal bags and deli containers. FoodSaver says this model is designed for use with their specially-made bags, but many people have successfully used it with Ziploc vacuum bags. Easy to use, easy to clean and portable, this vacuum sealer is a great choice for busy families who are always on the go. • Compact size means this sealer doesn’t take up much space on the counter. • Cordless design means you’re free to move around the kitchen. • Dishwasher safe nozzle makes this sealer easy to clean. • Compatible with all-size vacuum seal bags to keep all foods fresher for longer. • Not as powerful as full-size models. For simple sealing jobs, the FSFRSH0051 is a great option. Durable and easy to use, this food sealer will keep your foods fresher for longer but isn’t quite as powerful as a full-size model. View pricing and availability of the FoodSaver FSFRSH0051. 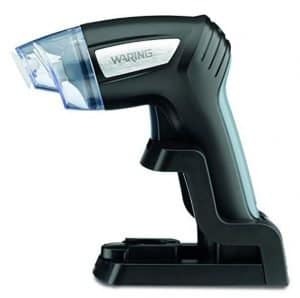 The Waring Pro PVS1000 looks more like a drill than a vacuum sealer, but this compact model is more powerful and long-lasting than competitors. With the ability to seal more than 30 bags on a single charge, this model’s battery life is very impressive. The PVS1000 features a pistol-style design that makes it easy to seal numerous bags back-to-back. Offering a compact design, this sealer won’t take up much space in your kitchen, and can easily be stored on the included charging stand in between uses. This model is extremely easy to operate, so you can start sealing your foods right out of the box – no learning curve required. Along with the sealer itself, you’ll also receive 12 one-quart bags and 12 one-gallon bags. All of the included bags are BPA-free and safe for boiling, freezing, refrigerating and microwaving. Backed by a five-year limited motor warranty, you can be sure your purchase is protected when you choose the Waring Pro PVS1000. Heavy-duty battery lasts long enough to seal at least 30 bags on one charge. Bags are included, so you don’t have to spend more on accessories. Pistol-style design allows for comfortable use. Not compatible with canisters or deli containers. The Waring Pro PVS1000 is a great option if you’re looking for a simple sealer for bags. While not compatible with canisters or deli containers, this model creates a strong, long-lasting seal. View pricing and availability of the Waring Pro PVS1000. While technically not a handheld model, the FoodSaver V4440 is still a compact full-size food sealer that’s powerful and easy to use. Compatible with nearly every FoodSaver product, this model will allow you to keep a wide range of foods fresher for longer. The V4440 is designed for use with a variety of FoodSaver products, from conventional bags to zipper bags, canisters, and containers. 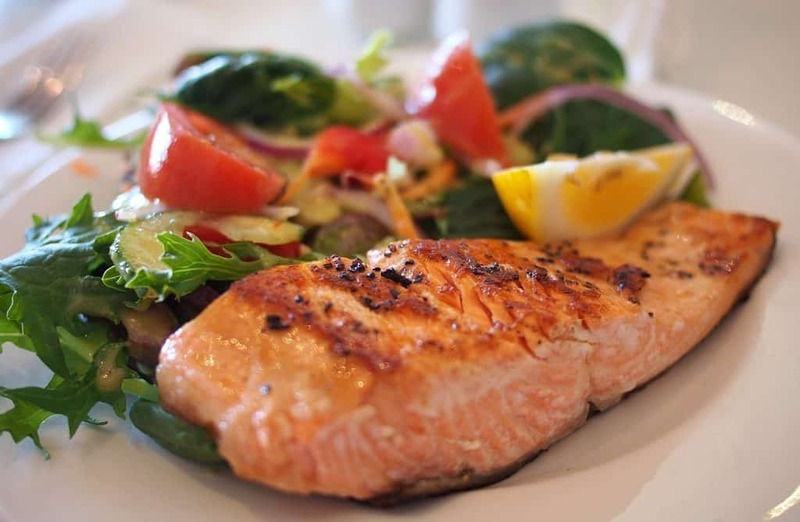 Automatic operation allows for easy use and sealing of foods to keep them fresher for longer. Bags are easy to seal thanks to the automatic detection feature, which automatically initiates the vacuum sealing process. The heat seal creates an airtight environment that keeps air out and prevents dreaded freezer burn. The V4440 also comes with a retractable handheld sealer that works with canisters, marinators, containers and zipper bags. The included slide-out drip tray catches any liquids that overflows from the bags, which makes clean-up quick and easy. As an added convenience, the drawer is dishwasher safe. Rapid marinate mode marinates your food in minutes, and the convenient roll storage keeps your bags within easy reach. Full-size model with a compact design. Handheld is compatible with zipper bags, canisters, and containers. Airtight seal prevents freezer burn. The V4440 is more expensive than your typical handheld sealer, but it also offers more functionality and a tighter seal. View pricing and availability of the FoodSaver V4440. Which Model is the Right One for You? All of these vacuum sealers are great choices, but not all of them are a good fit for your personal needs. That’s why we recommend sitting down and coming up with a list of your needs to help you find the model that will work best for you. 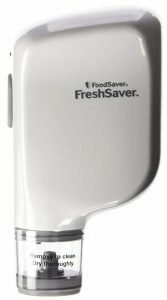 Our top choice is the FoodSaver FreshSaver FSFRSH055 because it’s a little bit bigger and more powerful than competing handheld models. But if you have a bigger budget, we recommend the FoodSaver V4440. While pricier, this model offers all the benefits of a full-size vacuum sealer, but also offers a retractable handheld sealer for use with canisters, containers and zipper bags. 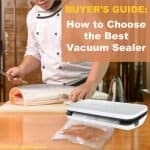 For even more reviews on full-size vacuum sealers, read our comparison article here.